1) Simple operation, import mailing list from text file, click start verification. 2) Automatically remove duplicate email address. 3) Support exporting mail list to txt, csv, xls and other formats, freely choose to export the column, such as export only email, or the corresponding URL is also exported. 4) Support exporting in different states, such as verification of the e-mail address, easy to import mail sending program for the next step. 5) Maximize the use of network resources to ensure the software achieving the best e-mail verification speed. 6) The same serial number can open multiple software instances on the same computer. 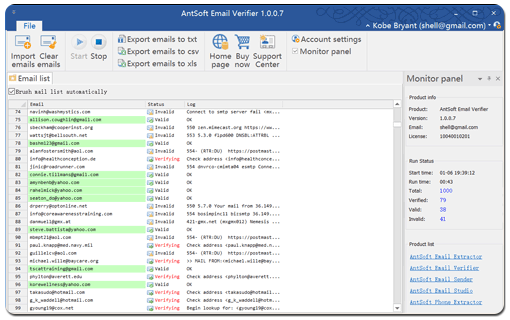 Antsoft Email Verifier is the fastest email verification software I've ever seen. It is so great with accuracy of verification. I used to have a lot of mailing lists, but many of them are invalid addresses. Now filtering through Antsoft Email Verifier saves me a lot of mailing time directly and gives me more transportation program. I highly recommend it to everyone. Getting a valid mailing list is the most important part for email marketing. Fortunately, I met Antsoft Email Verifier. I am very satisfied for the speed of verification, accuracy, or UI. With a valid mailing list, I can find customers who need overseas storage faster. My performance has improved significantly. I need to thank antsoftstore.com who developed Antsoft Email Verifier.